With PowerApps you tailor your app to closely fit your organization’s industry, nomenclature, and unique business processes. 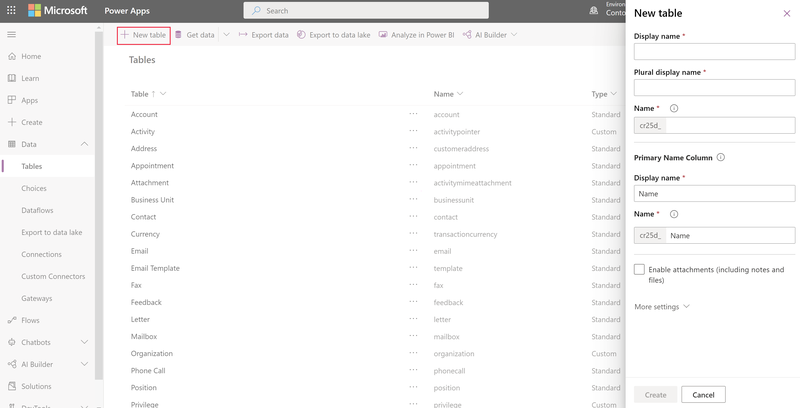 PowerApps app development includes adding standard "out-of-box" entities or creating custom entities. An entity defines the information you want to track in the form of records, which typically include properties such as company name, location, products, email, and phone. The topic will follow the company, Contoso, which is a pet grooming business that grooms dogs and cats. Contoso needs an app for client and pet tracking that can be used by employees across a variety of devices. Sign in to PowerApps. If you don’t already have a PowerApps account, select the Get started free link from powerapps.com. On the left navigation pane expand Data, select Entities, and then select New entity. In the right pane, enter the following values, and then select Next. In the list of entities, select the Pet entity that was created in the previous section. On the Fields tab, select the Pet field. On the Fields tab on the entity designer toolbar select Add field. On the Field properties pane, enter or select the following values and options. a. Select Add new item. b. Replace New option with Dog. c. Select Add new item. d. Replace New option with Cat. Select Searchable, and then select Done. On the entity designer toolbar select Add field. On the Field properties pane, enter or select the following values, and then select Done. On the entity designer toolbar select Add field. On the Field properties pane, enter or select the following values, and then select Done. Select the Relationships tab, on the entity designer toolbar select Add relationship, and then select Many-to-one. On the right pane, in the Related list select Account. Notice that when you add a many-to-one relationship, an Account field with the data type Lookup is automatically added to your list of fields on the Fields tab. Select the Views tab, and then select the Active Pets view. If you don't see the Active Pets view, select Remove filter. On the view designer select Add Columns, select the following columns, and then select OK. Select the Created On column, select Remove, and then select OK to confirm the column removal. To arrange the columns, select the column you want to move and then use the <- and -> arrow buttons until your view looks like this. On the view designer toolbar, select Save and Close. Skip this step if you only want to use the Pet entity in a canvas app. 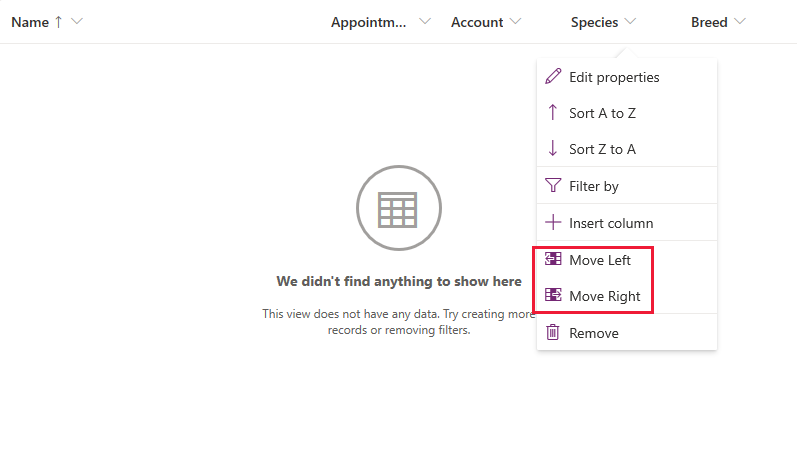 On the left navigation pane, expand Data, select Entities, and then select Pet. Select the Forms tab, and then select Information next to the Main form type to open the form editor. On the form editor, drag and drop the Species, Breed, Appointment date, and Account fields located on the Field Explorer pane on to the General section of the form canvas until the form looks like this. Select Save and close to close the form designer. Now your entity is ready to be used to build either a canvas or model-driven app. In this topic, you learned how to create an entity that can be used to create a useful app. To learn how to create a model-driven app, see Build your first model-driven app. To learn how to create a canvas app, see Create an app from scratch.